There’s a lot that could be said about the 2013/2014 Blueshirts, most of which has been rehashed several times on this very internet. You could talk about how they banded together after the death of Marty St. Louis’s mother, or how they finally had a fourth line that could “grind it out” with heavyweights like Boston. You could get analytical, and discuss the Rangers as the puck possession monsters they were, finishing 6th in the NHL in CF%, or how they overcame a season of bad luck (25th in PDO) to make a miraculous Stanley Cup Final run. I personally don’t care about narrative, no matter how inspiring or sappy, and the analytics will make Rick Nash fans like myself cry uncontrollably. This leaves only one thing to discuss–letting go and moving forward. 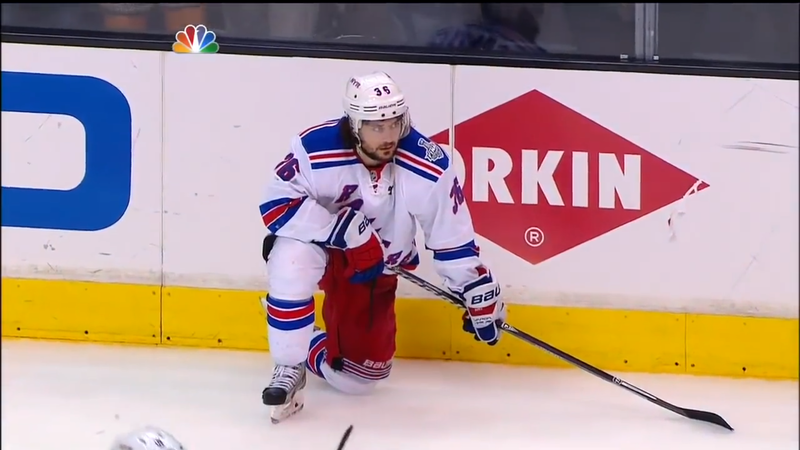 Zucc sitting at the half-boards, half distraught, half glaring, will haunt me all summer. Despite my unabashed fangirling over Carl Hagelin–speed demon and penalty killer extraordinaire–no single player has captured my heart quite like Mats Zuccarello. Not only was he the “energy” and “heart” and “soul” of the Rangers skaters, but he brought legitimate talent to the bottom six. I can’t count how many times I found myself laughing as he tried to check guys much bigger than he is or used his creativity and willingness to battle down low to create offense. Basically, he’s awesome, and this team was full of guys who gave you every reason to watch and love them. No matter how much I dislike easy narrative, I’d be lying if I said the resolve MSL played with after losing his mother didn’t make me love him as a player even more. Ryan McDonagh had a coming out party of sorts, not only playing his usual brand of outstanding defense, but putting up big point totals from the blue line on a national stage. Even Derek Dorsett’s tough work drawing penalties and maintaining possession on a magnificent fourth line eventually won me over. Fact of the matter is, I loved this Rangers team. They were talented. They had personality. They were young kids looking to break out and old guys trying to win one more. Break up day was legitimately painful for me. There’s a depressing finality that it’s all over and the same group of guys you watched for 100+ games will never come together as a complete unit again. Contracts expire. Parts are changed out. One moment you’re watching this and the next you’ve traded your top two centers for Rick Nash. Letting go of a team like this is near impossible for me. I have been a Braves fan all of my life, and this Rangers team was more memorable and more endearing than any of those Braves teams I grew up with. There are very few guys on this squad that I didn’t wholeheartedly enjoy watching on the ice. One (Dan Girardi) is a “defensive defenseman” in the stay-at-home, grind it out, shot blocking style so beloved by ex-coach John Tortorella, and another (Brad Richards and his potential $5.6 million cap hit through 2019, should he retire) has already been informed he’ll be bought out. That Richards buyout is the first major step in moving forward as the Blueshirts begin the long climb back to the Stanley Cup Finals. By freeing themselves of Richards’s $6.67 MM cap number, they have a bit over $23.5 million to spend. Whether they choose to pursue outside options like Paul Stastny or resign their own guys will largely determine this team’s success. Zuccarello, Derek Brassard, Chris Kreider, and John Moore are all RFA’s who figure to be resigned, likely on bridge deals like the one Derek Stepan signed last year. The trickier issue is on the UFA front, where Brian Boyle and Dominic Moore, two members of that stellar fourth line, are both without a contract. Benoit Pouliot’s 36 points from the 3rd line will likely earn him more than the $1.3 MM he made this year, and Anton Stralman had a solid year and a hell of a playoff run, leading some to suggest he could be in line for 3-5 years at $4.5 MM+. It’s probably even odds that Stralman is retained, as he turned down a 3-year, $9 MM extension offer earlier this year, and the Rangers are likely to be sitting around $11-12 million in cap space after re-signing their RFA’s with five roster spots left to fill. Boyle and Moore are the team’s lone centers who can consistently win faceoffs, but with both due significant raises, thhe too may be priced out of New York’s cap space. If I had my druthers, I would have Sather pursue depth in lieu of star power. We saw what a star-centric roster can do in 2012, as the contracts of Marian Gaborik and Rick Nash (and the trade to acquire him) squeezed cap space until the bottom six was devoid of talent. Pittsburgh is another prime example of a team that struggles mightily if the top talent isn’t performing, and the Rangers 3rd and 4th lines absolutely worked the Penguins over in the Eastern Conference semis. While adding Stastny, Joe Thornton, or Jason Spezza is the flashy James Dolan move, the Rangers are likely better off finding multiple depth pieces to go with a solid puck possession 3C like Mikhail Grabovski who can compliment Hagelin/Zucc/etc. Depending on the outcome with Stralman, a more defensive-minded partner for John Moore who can still move the puck may be a target, unless they believe Dylan McIlrath is ready to contribute for more than 20-30 games. At $6 MM+ for Stastny and a bare cupboard of prospects for Thornton/Spezza, the big splash is a long shot. Regardless of the approach, the majority of this club will be back next year, including most of the core contributors. 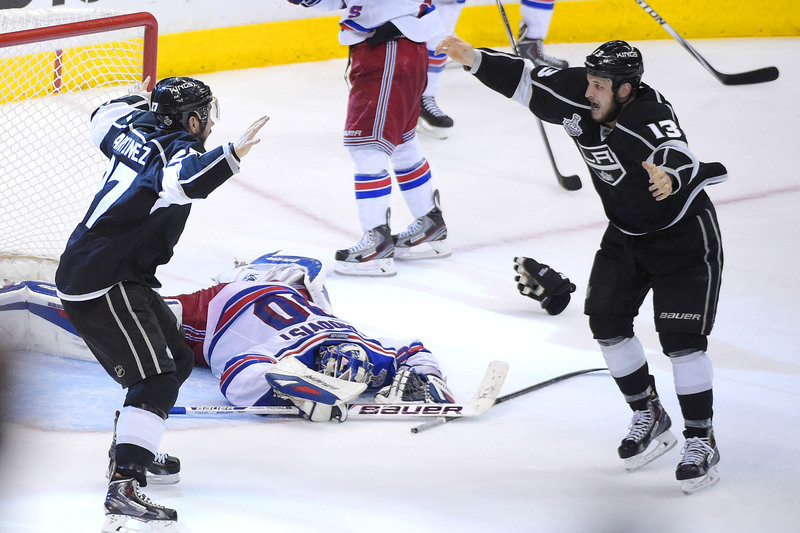 As much as I loved this year’s iteration of the New York Rangers, the cap brings with it certain harsh realities. The Rangers’ affinity for Brian Boyle’s hard nose style of play and Dom Moore’s heart, leadership, and story can’t lead to mortgaging the future. We’ve seen that despite the fans’ love affair with Ryan Callahan, Sather isn’t afraid to make moves to improve the team while being cap conscious. The Richards buyout will be the first shoe to drop in what promises to be an interesting off season as Sather sifts through the roster, locking up young players and navigating around a tight cap. Ultimately, the contracts and progress of the young core–Kreider, Stepan, McDonagh, Brassard, et al.–will determine how long the current window is open and how much flexibility the team has through 2016 and beyond.